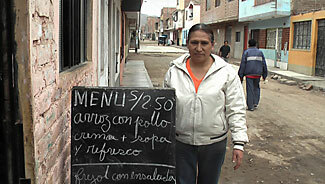 With food prices on the rise, 'community kitchens' provide half a million Lima residents with affordable daily meals. 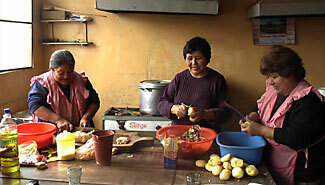 Lima, Peru - Steam rises into air thick with the scent of garlic as women prepare lunch for 120 of Peru's neediest. But this is no charity. Obaldina Quilca and Veronica Zelaya – who are on cooking duty today – are also beneficiaries of one of the estimated 5,000 community kitchens run by women in Peru's capital, Lima. 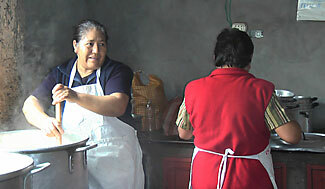 (left) Solidarity: Two women cook a pot of bean stew at a community kitchen in Lima, Peru. The kitchens started in the 1970s and persisted through the '80s and '90s, through dictatorship, terrorism, and hyperinflation that brought Peru to its knees. And now that global food prices have put basic staples out of reach for families across the region, the kitchens that feed an estimated half million residents of metropolitan Lima every day are again providing a refuge. But their work goes well beyond survival; the kitchens have become a vehicle for collective action, giving women the self-esteem to denounce government shortcomings and demand change. They have risen as one of the most significant women's organizations in Latin America, and today are on the forefront of protests demanding solutions to a cost of living that many say is reversing recent progress in reducing poverty. "You have to fight for your rights," says Ms. Quilca, as she mashes a pile of garlic by stone in her community kitchen, Diez de Febrero, in the hardscrabble neighborhood of San Martin de Porres. "With marches you can obtain your objectives. If you don't march, you get nothing." A narrow set of stairs outside a non-descript building leads to Diez de Febrero, a bright, tidy kitchen of yellow walls, a cement floor, and a giant, tiled sink. Work here starts early – at 7:30 a.m. Those on duty put to boil two massive pots of rice, holding 22 pounds each, and then head to the nearby market. The 40-some members of this kitchen take turns cooking, and in return receive their daily meals for about 60 cents (1.70 soles) each. By 1 p.m., members have picked up their lunches, served in big metal pots they drop off at the kitchen each morning, and taken them home to their families. Today's menu: chicken soup, rice, and beans with chicken. This is one of some 125 such kitchens in this neighborhood alone, a former squatter community that has developed into one of the largest districts in Lima, with over 500,000 residents. As food inflation hits Peru, as it has the world over, the community kitchen is providing support to the neediest families, offering meals to the community at large. They charge more for nonmembers, 90 cents a meal, but it is still cheaper than cooking at home. They now cook ten times as much as they used to before prices spiked, the women say. They also cook free meals for the sick, elderly, and those in extreme poverty. "They are playing an important role as the prices go up," says Maria Bozeta, president of the Federation of Women Organized in Committees of Self-Sustaining Kitchens (FEMOCCPAALM), which oversees 1,300 kitchens in metropolitan Lima. "They are seeking solutions that affect the poorest; they are being proactive." The poverty rate in Peru has dropped five percentage points in the past year – to about 40 percent of the population. But higher food prices are reversing some of those gains – and with little government response, poor women are essentially supporting the poorest. "Women have filled in where the government has not been," says Diana Miloslavich Tupac, a coordinator for political participation at the women's organization Centro Flora Tristan in Lima. "Today they are cushion for the poorest." But they are not just cooking meals; they are also relying on their people power to protest. In April, some 8,000 members of FEMOCCPAALM marched across downtown Lima demanding that the government increase the 19 percent food subsidies that it sends the kitchens. Last week, the Club of Mothers, another community kitchen organization more closely linked with the government, staged a protest outside the Ministry of Women and Social Development. "We want a solution!" chanted dozens of women from all over Lima. "Everything is costing us so much more these days," says Rosio Orellana, a member of the group. "It is reducing our rations." It is no surprise that these women are on the forefront of one of the biggest issues facing Peru today, says Ms. Miloslavich Tupac. While community kitchens formed to solve the practicalities of feeding families, they have over the years metamorphosed into a massive movement that the government cannot ignore, one whose tenets have found their way into the cornerstone of public policy on food programs in Peru, she says. Most of these women once were anything but political activists. Many joined clubs timidly, against the will of their husbands. "We used to be embarrassed, we wouldn't leave our houses. Now we know how to defend ourselves," says Ms. Zelaya, who moved to San Martin de Porres 33 years ago from the rural mountains. Her husband worked in a ceramics factory, and on that salary alone they could not feed their six kids. "Now we have awoken. And speak out, speak out, speak out." Their skills have been fostered by training programs that go well beyond food. At Diez de Febrero, most women have rotated at one point or another as president. They also run a store, whose proceeds they use toward the daily menu. At FEMOCCPAALM they participate in marketing, leadership, and nutrition workshops. "They used to only have a role in the home, now they are protagonists in society," says Ms. Bozeta. "They are intermediaries between the government and the community." When Quilca wanted the road outside her street paved six months ago, she organized a chicken roast and together her street pulled enough money to lay down the concrete. They have fought for light, electricity, garbage collection, and better education. "I used to be afraid to talk in public," says Quilca. "Now I say, 'Be quiet, listen to me!' "
Bozeta says the kitchens have faced criticism over the years: that they are not doing enough to address the structural roots of poverty, that their services don't reach the poorest in society, and that they are inefficient. But Bozeta says their work should not be seen as a solution but as a complement to government obligations. "They are making change in the development of the country," she says. And they have no plans to back down from a food crisis that hits at the heart of their social work. FEMOCCPAALM kitchens, which count 26,000 members throughout Lima, receive 19 percent of their food from the government; the rest is paid for by members. Other soup kitchens like the Club of Mothers and the Glass of Milk Committee, a children's breakfast program, are more heavily subsidized. But the subsidies haven't risen with the food prices, and they don't buy nearly as much food as they once did. Women are now demanding more money. For now, they get by cooking with less rice, adding fewer vegetables to the soup, or buying cheaper, beaten-up potatoes in an effort not to raise their prices. "They are facing difficulties, but when there are problems with food the kitchens become stronger," says Raul Zibechi, an Uruguay-based analyst on social movements who recently published a research paper for Center for International Policy on Peru's community kitchens. The kitchen networks also provide much-needed solidarity for many women. At Diez de Febrero, like in thousands of kitchens in Lima and more than 10,000 across the country, women have been cooking together for over 30 years. They are like sisters, finishing each other's sentences, gossiping about the price of food, and bickering over facts and figures. "When I came here, I had eight children, and my husband was abusing me," says Delfina Blas, a founding member of Diez de Febrero. Her husband left her when her youngest baby was 2 months old. Her kids were too young to comprehend; it was the women in this kitchen that helped her pull through. "My kids have been eating this food all their lives." "We are like a second family here," Ms. Blas says. "We always have been. And here we are, all these years later, still fighting."